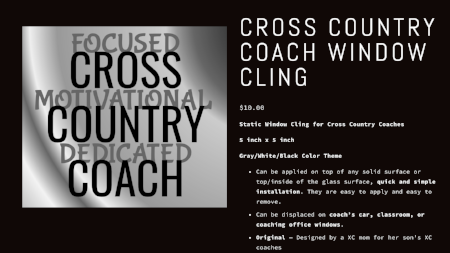 After searching online unsuccessfully for a car window cling to thank my son's high school running coaches, I took it into my own hands; designing and ordering my own original decals. Carefully I selecting a decal type that LEAVES NO RESIDUE and can be seen on shaded car windows. Currently, I have ONLY TWO extra up for grabs! Plus considering adding more options in colors, designs, and words. Any feedback or orders welcome! Give feedback and make custom requests HERE!